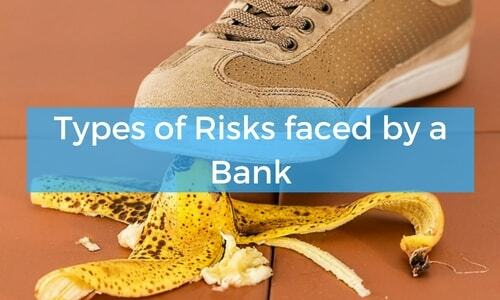 One of the most popular question in bank interviews is - What are the various kinds of risks faced by a bank ? Risk arises due to fluctuations in market price of marketable securities. Bank generally invests in equity shares, loss arises to bank due to fluctuations in equity market is known as market risk. IRR arises due to fluctuation in the interest rate. If a bank had a lot of fixed deposits, fall in interest rate will cause loss to bank. Similarly, if a bank had a large amount of fixed interest rate loans, increase in interest rate will cause losses. Banks may have large foreign exchange assets due to mismatch of the maturity date. Fluctuations in exchange rate cause loss to the bank. Risks arise due to the failure of day to day activities, system or people. It includes both internal and external frauds like failures related to policies, laws, regulations, documentation or any technological risks. Risks arise due to the inability of bank to meet its obligations and it refers to a situation when any asset may not be realized in cash. Also, we can say that it is a mismatch of assets and liabilities. It is a more important than any other risk because it has to be kept within limits, otherwise banks dependence on money market would increase. I have shared NPA concept in past, you should also read that. when is the interview result of po 3 going to be published mr. ramandeep ?? hello sir, if we compare probationary officer and specialist officer then which is better po or so ? sir, if we compare probationary officer and specialist officer then which is better po or so ?